Rhinoplasty is one of the most applied surgical procedures in the world. Because the nose is in the middle of the face and makes an effective contribution to the beauty of the face, its internal and external deformities that are aesthetically problematic and also cause health problems are corrected. Nose aesthetic operations within the Estetik International Health Group are planned with the approach of keeping the patient's psychology first in line with the awareness that facial beauty is a whole, without sacrificing comfort in the recovery process. Rhinoplasty is the name given to aesthetic surgeries implemented to reshape the nose. During these operations, the nose may be enlarged or shrunk; the angle of the nose with the upper lip can be modified; the position of the tip of the nose can be changed or any imperfections as a result of any impacts on the nose or innate aesthetic appearance can be corrected. During rhinoplasty, the surgeon cuts into the nose or top of the nose using different techniques to gain access to the nose-supporting cartilage and bones. As many incisions, such as lacerations, are usually invisible after the surgery, it is mostly done inside the nose. Depending on the desired result, some bones and cartilages can be removed or tissue can be added (from another part of the body or by using a synthetic filler). After the surgeon arranges and reshapes the bone and cartilage, after they are adjusted according to nose structure, the final adjustments are made. If necessary, a splint may be placed outside the nose to aid in the recovery period to support the newly formed nose structure. The term Rhinoplasty derives from the term "rhinoplastic", which means "changing the shape of the nose". The technique involves primarily accessing the nose bone and cartilage support. This is achieved by lacerations made inside the nose, which cannot be seen by us. In some cases, an incision is made in the area of the skin that separates the nostrils. The underlying bone and cartilage are then reduced, increased or rearranged to form a newly formed structure. For example, if the nose is too large, the surgeon can reduce the size by shaping the cartilage in this area. If the nose bridge is high and lobulated, it can be reduced (rasped) to give a better profile. If any part of the nose looks disproportionately small, cartilage or soft tissue grafts can be placed to better fit the face. The upper lip of the nose or the angles connected with the forehead can also be replaced by further shaping the nose support structure. The textures are then redrawn on the new frame and the lacerations are covered. A small plastic splint may be applied to the outside of the nose to help minimize swelling and to help protect the new shape while the nose is healing. In the nose, a soft absorbent material, i.e., a bumper, can be used to protect the softness of the dividing wall, called septum, during air passages. Alternatively, soft nasal supports may be placed to allow post-operative nasal breathing. However, we cannot say all the patients will have the same treatment as it differs for each patient. Even minor corrections to be made on nose can make a difference in general face concordance. Most patients report little pain after surgery and any discomfort is easily controlled with mild pain relievers. • Those who suffer from inadequate or lack of breathing, snoring, sleep apnea, etc. As Estetik International Health Group, we show our patients the image they will get after operation by using digital simulation technology in different versions before the nose surgery. In this regard, our patients get the operation without any surprises. Following the clarification of specific nose problem our patients have, we plan the specific technique we will use at our clinics. Simple Rhinoplasty: Simple Rhinoplasty is a technique that is performed under local anesthesia and applied in a very short period of time within the Estetik International Health Group. Shaping the tip of the nose is an operation that is applied in order to lift the tip of the nose, which has ptosis depending on the gravity or which is innate. This technique, which is applied only by using a rope and without the use of tampons, plaster and similar apparatuses, ensures that our patients have the most comfortable process after operation. Rhinoplasty: It is the classic nose surgery that is applied to the structure of the nose which has arch or which has lost its form as a result of any impact. The subject we are most interested in in nasal surgery is the age and gender of the patient. It is also aimed that the new nose design should be suitable with total face contour and be made in the frame of a plan designed according to the specific person. Secondary Rhinoplasty: Revision nose treatments can also be referred to as secondary Rhinoplasty, an operation that we apply to patients who have previously undergone with nose surgery. Patients who suffer from sagging on their nose, who do have the nose they desire, and who experience difficulties in breathing or smelling after the recovery period, can have secondary Rhinoplasty. As we have always said, the nose is our organ that also contributes to the beauty of face. But we especially want to emphasize that the skin, the lips, the eyes and the hair are the regions that should always remain fresh. For this reason, we have a different perspective for Rhinoplasty when compared with most aesthetic surgery clinics and we think that nose designs should be made specifically for each person and we act accordingly. The face contour and skin structure of each patient are different from each other. If each person would have the same nose type, this would appear as a nice nose which might be incompatible with the face. The nose should be suitable with the eye, the lip structure and the chin and cheekbones, and the design should be planned in accordance with these. Although Rhinoplasty can make improvements and surprising changes for many patients; the fact that the structure of the nose changing in a reliable way is very important in order to not cause any new problems for the patient. Accordingly, in addition to the anatomical features such as skin thickness and skeletal size of those who want to have Rhinoplasty; functional constraints and long-term durability should be considered and planning should be done accordingly. Although the patient's wishes are very important, request for an ultra-thin nose structure and attempts for that may cause complications. For this reason, the patient's anatomical structure and facial contour line must be examined in accordance with the patient's needs and request of Rhinoplasty. A neatly reshaped nose with elegant lines and a pleasant contour structure that adapts to it is possible for almost any healthy patient. For this reason, in Rhinoplasty, whole face must be considered. The aim in Rhinoplasty is to resolve the problems and reach a reshaped structure which is suitable with the face contour and which does not make the aesthetic application obvious. Rather than complex Rhinoplasty, we always put the functionality upfront and want the rhinoplasty to be harmonized with the whole face. You can see the new nose structure created with 3D digital simulation in Estetik International clinics, and you can examine the ultimate end result computerized imaging of your nose after operation. Rhinoplasty can be applied with general or local anesthesia. 1 night of accommodation at the center of operation will be necessary. This process can be longer or shorter, depending on the technique of Rhinoplasty applied. According to the interventions made in the nose, the splints and bandages around the nose will be removed within about one week. Currently, most Rhinoplasty operations are performed without using such apparatuses. You may feel your face swollen, or you may observe reddening and bruises for a few days around your eyes and nose. The cold compresses recommended by your physician can be applied and they will help you to relieve the swell and pain. Your doctor may also recommend pain relief medicines, but you should follow the recommendations and not do anything which is not recommended. During the first few days after surgery, you may need to keep your head up and relatively stable while you are sleeping. It can take a few weeks to get back to the tiresome activities. Depending on the Rhinoplasty technique and your build, it is very natural if you feel swelling, bruise and pain. The problems such as edema and bruises on your nose will be removed fast and gradually. You can start re-engaging in your social life within 1 week. In cases of Simple Rhinoplasty, it is possible to return to social life immediately. In this period, you must protect your nose from the sun's harmful rays and the impacts caused by external factors. Wearing wide collar clothes and wide hats will make it easier for you. We advise you to wear lenses instead of using glasses, and be very careful while entering the sea or pool. After the Rhinoplasty, your new nose shape may settle within 6 months. We therefore recommend that you be patient to see the final result and inform your doctor of possible improvements throughout the process. Plaster and tampons, which allow a healthy recovery of Rhinoplasty in full, are at the top of fear subjects for most patients. Today, we want to remind you that breathing is much more comfortable with perforated tampons. Also, the tampons placed in your nose are removed painlessly after 1 or 2 days, and the plaster is removed after 1 week on average. Why should you have Rhinoplasty? Rhinoplasty can change the size, shape and angle of your nose and can make it proportional with the rest of your face. It can also correct structural problems that lead to chronic obstruction and breathing problems. The results of rhinoplasty will vary depending on what kind of correction you want. It is important that you and your plastic surgeon agree on the purpose of the operation. If your expectations are realistic and your plastic surgeon shares them, you will probably get the results you want. Why should you have Rhinoplasty? The answer to this question is a process that is completely up to you. If you have a health-related problem such as a breathing problem and you need to have a Rhinoplasty, or if your nose does not satisfy you aesthetically and causes concern, you should make a decision and discuss it with an aesthetic surgeon and experience the final result. Why should I have a Rhinoplasty Operation? If you have a big belly that makes you unhappy and you are not happy about the look of it, if you have experienced skin sagging on your abdominal area after a weight loss, if you are unhappy with the sagged look of your abdominal area after the pregnancy, if you had a liposuction operation and now your belly is sagged; then you can get benefit a Rhinoplasty operation. Why should I get a Rhinoplasty operation? If you are unhappy with the look of your nose, you think that you would be much happier after a rhinoplasty operation; if you had an accident and the shape of your nose got worsened after this accident; then you can be a good candidate for rhinoplasty operation. It is a well-known fact that individuals with feeling themselves beautiful have higher self-esteem. Therefore; if the look or functionality of your nose bothers you, you can get benefit a rhinoplasty operation. Each year, half a million people apply Rhinoplasty operations to change the look of their nose. While some of these people have an innate non-aesthetic nose, some of them are uncomfortable with the change in their nose as a result of aging. Some prefer Rhinoplasty for reasons such as an injury, a nose collision, and a lack of breathing ability. Because the nose is centrally located, its size and shape have a great influence on the person, and this is an undeniable fact. When we look at trends in the world; we see that young people usually do not experience any problems with their noses, however, as people become older, they suffer from the loss of muscles, bones and fats. Especially the ptosis at the tip of nose while smiling causes a great discomfort in people. It is possible to lift the tip of the nose by using techniques aiming the nose tip or temporary treatments such as filling and botox. Moreover, the rise of social media, the selfies and the mobile phones that almost everyone has, and the constant exposure of seeing the self, have also been instrumental for people to meet their faces and noses one-on-one. In the past, they could only see their noses in the mirror from opposite angles; however, now they can see by using their mobile phones at various angles, and feel the need to pose according to their nose structures. Parallel to this, it is possible to consider Rhinoplasty among the rising trends in recent years. You will be monitored in post anesthesia are until you feel good enough to discharge after surgery is completed. There is no significant pain in the majority of patients, but drugs may be given to prevent any post-surgery problems. It is likely that you will feel limited nose breathing in the first few days after surgery. The edema that occurs in the nose is caused by the condition that occurs as a result of the operation, and as this condition gets better, your breathing will increase when the swelling decreases. On the first day after surgery, you may feel a slight swelling of your face. Some patients may experience swelling and/or bruise around the eye. It is imperative that you follow the instructions of your surgeon. Keeping your head high will reduce swelling. You should protect your nose from any external impacts and the interior and exterior structures during the recovery process. You should avoid activities such as heavy lifting, excessive force, sun exposure that may increase the risk of injury. You should take care not to put too much pressure on the nose bridge, and you should obtain information from your doctor about the use of glasses. Tape and other apparatus can sometimes be used to attach goggles without stressing the area during recovery, and you can ask your doctor about this. Monitoring and post-operative care are very important for the success in Rhinoplasty. You should immediately notify your surgeon of any concerns about your postoperative course, such as excessive bleeding, unexpected swelling, fever, or severe pain. It is very important that you implement monitoring appointments with your surgeon. For healing techniques such as massage, nasal spray or small drug injections that resemble cortisone, or for techniques that further improve the desired end result, you should first get the approval of your doctor. Private and state insurance is generally does not cover surgery because of cosmetic reasons. With accurate analysis, realistic patient expectations and a qualified aesthetic surgeon, you can reach a result beyond your expectations. As we always say, your nose is one of the most obvious features of your face, and its function is extremely important in your daily life. If you are unhappy with the appearance of your nose, or if you have functional complications that make your breathing difficult, you can compromise your life quality and be unhappy. Rhinoplasty surgery can correct physiological complications that impair breathing ability. You can also get satisfactory results from an aesthetic point of view. There are various types of Rhinoplasty designed for all of them. Functional rhinoplasty is a surgery that corrects physical anomalies which prevent breathing caused by congenital defects. They can also correct the effects of physical trauma. It is made by reshaping and repositioning cartilage and nasal bones. Your aesthetic surgeon will ensure that you breathe and be satisfied with your appearance. Here, the "open" or "closed" procedure can be applied. While open rhinoplasty includes lacerations exterior of the nose, closed rhinoplasty involves only intranasal lacerations. Surgeons will use the closed technique if possible in order to prevent visible scarring, but in severe cases of damage, open rhinoplasty may be necessary when the area of treatment is problematic. They work to reduce visible marks as much as possible. The two passages leading into the nostrils that connect the nasal cavity from the top of the nose to the skull is called Septum. Septum consists of several parts, such as the cartilage and bone. The lower part rests on a supporting bone that you will feel at the point where the anterior nasal vertebrae, the area above your nose and upper lip, meet. A septum may have traveled to one side of the nasal cavity, without creating two equal paths. In terms of appearance, it is curved and often leads to inability to breathe comfortably. This is the situation we call as bent nose. When the septum bends to one side, it can form an S-shape, or it can bend like a C-shape. Both deviation septums may block airflow and ultimately damage the soft tissues in the nose. Depending on where it derives from, the surgeon may have to reform the cartilage upper part of the nose or the cartilage lower part. Rhinoplasty can also correct large bones. There are three types of concha: an upper concha that is high in the nose between the eyes; mid-nasal concha; and the lower concha that ends right above the nostril. Sometimes the tissues are removed and their size is reduced, and the enlarged bones are corrected. Sometimes it is rasped, and this is a process decided according to the current state of the patient. Like enlarged concha, nasal polyps are usually associated with allergies and irritated interior nose. This growth develops in the nasal passages in the form of soft, jelly-like ampoules. To remove them, the surgeon will use an apparatus to reach the nostrils and remove them carefully. Unfortunately, the possibility of repetition of the nasal polyps is very high, and you should consider the possibility of repetitive nasal polyps even if they are removed during the Rhinoplasty. When it comes to nose operations that are only made for aesthetics purposes, the ultimate goal is to improve the appearance of your nose and turn it into a complimentary part of your face. Different techniques can be used to obtain the image of nose you described to your doctor. When a surgeon evaluates the nose, he/she will take three different notes: upper vault (also known as bone vault), middle vault and low case. Your final results may require adjustment for multiple vaults to obtain the correct rates. Radium is the upper bone part of nose. Radium and underlying cartilage may be large, or they may collapse with an impact, which aesthetically disturbs you. Your surgeon can shave the small size ones carefully to reduce the shape of the base. Your surgeon can also heal this area by taking cartilage tissue from another part of your body for a region that has suffered a problem, has been hit and collapsed. If the nose is slightly curved or shifted to one side, your Rhinoplasty surgeon can correct it by reducing some bones or cartilages or by physiologically shifting the tissues. Like a broken nose which needs a functional rhinoplasty, your surgeon can apply a splint to keep the nose in place during the recovery. Your nose tip may not be thick or it may not have proper rotation. Nose tip aesthetics means that the tip of the nose turns up or down. By adjusting the tip of the nose through reshaping the cartilage, your surgeon also works with great care to the base of the nose as it affects tension and rotation. If you look at your profile, the nasolabial angle consists of two lines: from the tip of the nose to the region above the upper lips and from the lower lip of the upper lip to the nostrils. The rotation of nose protrusion and tip effect the angle rate. In most cases, surgeons aim to create a nasolabial angle of 90 to 95 degrees in male patients and an angle of 100 to 105 degrees in female patients. A combination of projection and rotation adjustment techniques can sensitize this angle. Each person has a unique aesthetic feature. Not every member of a particular race shares these features, but sometimes there are those who choose to have plastic surgery to change them. Rhinoplasty is a popular treatment among those with a wide nose due to their ethnic characteristics. Many patients of African and Asian descent are considering rhinoplasty to reduce the width of the nostrils from one end to the other. At Estetik International clinics, we do a lot of ethnic nose or wide Rhinoplasty. Aesthetic surgery should never change the unique characteristics of an individual. Instead of that, it should increase the natural beauty of a patient. If a patient comes with an image of nose which will not fit him/her should be explained first. If you do not know rhinoplasty for this reason, you must first of all trust the vision of your surgeon. Your surgeon will give the best decision for you. If your surgeon thinks that your nose is not going to fit you and that you will not be satisfied in the long run, it will be the right approach for us to change your goals and tell you that you need to move as far as possible from your persistent approach. These aesthetic operations are customized. After determining the most suitable rates for the person himself / herself, you will digitally presented by determining the most suitable measures with your doctor's recommendation. The digital media also allows you to see what you will encounter with the nearest reality after the surgery and by preventing any surprises. Latest technology is used during the operation. Our doctors always try to share the most sophisticated knowledge with you by participating in scientific conferences all over the world to follow the scientific developments and to get information about new congresses and occasionally presentations in various congresses. 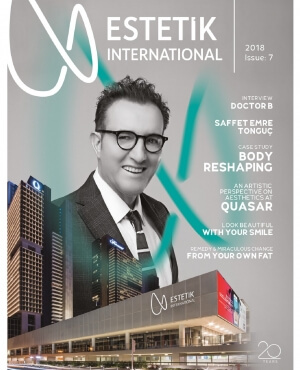 Estetik International is based in Istanbul and it has been serving to our patients in Turkey and worldwide for long years. With the dedication of all of our employees, we work to ensure that you receive an excellent service from your initial admission to the aesthetic center until you are discharged. After the discharge, we make sure that our patients are happy and we always monitor. Please contact us for more information. Our representatives are trained to help you in all your questions. Our high quality standards are carefully checked regularly for patient satisfaction and all our staff are often trained. In the medical language, Rhinoplasty means the reshaping of the nose.It is not only the reshaping of the nose, but also the surgical procedures performed on the nose that suffer from functional defects due to birth defects or subsequent trauma. What is the price for Rhinoplasty? For Rhinoplasty prices, you can obtain information by calling our Estetik International clinics or our call center.The Ministry of Health forbids to provide public information about the cost of cosmetic surgery in open venues. Rhinoplasty surgeries are generally safe surgical procedures, but as with every surgical operation, there are some potential risks.Our professional Rhinoplasty surgeons who work our institution do their best to reduce the risks and to ensure patient satisfaction. What are the preparations for Rhinoplasty? First of all, you will meet with your surgeon who will do your Rhinoplasty operation and make a plan and concentrate on realistic expectations.The suitable Rhinoplasty technique for your nose and face line is determined.In the meantime, your doctor will tell you what you need to do before the operation.You can always contact your doctor for any questions until the date decided for Rhinoplasty. I am a smoker, will that effect my Rhinoplasty operation? Smoking is a harmful habit that causes the tissues suffer from lack of oxygen.By smoking, you will prolong your recovery process after Rhinoplasty, and you will also reduce the efficiency of anesthesia.For this reason, you should definitely tell your doctor if you smoke and you should quit smoking at least 2 weeks in advance.Maybe, this could be a good time to completely quit smoking. Procedures for Rhinoplasty have differences according to the ed technique.Usually under general anesthesia and depending on your current nose condition, open or closed operation is performed.The operation is completed after the nose has been shaped functionally and aesthetically. How long does recovery last after Rhinoplasty? According to the surgical technique, tampon and plaster will be placed on your nose for the first week.After surgery, there may be swelling, mild pain, and redness around the eye for the first week.During this time, you should pay attention to your doctor's recommendations.After a week, you will witness that recovery process accelerates from day to day. What is forbidden to do after the Rhinoplasty? You should avoid exhausting activities for at least two weeks after Rhinoplasty.You should protect your nose from the impacts and the sun rays.You can use large hats for that.Your doctor will tell you when it is safe to return to your daily activities. You can often see the results of your Rhinoplasty as soon as the swelling in your nose reduces.You will generally not experience any problems related with respiration.The final result and the exact placement might take 6 months. What are the alternatives for Rhinoplasty? You can often see the results of your Rhinoplasty as soon as the swelling in your nose reduces.You will generally not experience any problems related with respiration.The final result and the exact placement might take 6 monthsIf you do not have any problems like breathing or loss of function, you can shape your nose with simple Rhinoplasty or filling applications without surgery, eliminate profile defects and even lift the nose tip.